2013 – Challenges and Resolutions! Interlude 2 – Archaeology: A thing of the past? Oxford Literary Festival 2013 report – Hilary Mantel and Paul Roberts – Bring Up the Bodies and Hug a Roman! It’s time to go back to the Moon. In the near future, with space exploration stalled, NASA decides that it needs some good publicity. What better way than to send a bunch of people to the Moon in the full glare of the cameras, with every step of the journey monitored by the media and social networkers? Actually, there is a better way. Make half the crew teenagers, recruited by means of a glorious international lottery, and you have the makings of some fabulous reality show. And so we have Mia from Norway, Antoine from France and Midori from Japan, three youngsters aged 16 and 17, who find themselves not only envied by the world but also facing their fears. The novel is divided into two and much of it is not spent on the Moon. A generous amount of time is spent giving the three teens their chance to vent against the injustices of the world, the stupidity of their parents and the meanness of friends and boyfriends/girlfriends. However, far from finding this irritating, I was genuinely interested in their stories, especially as they were a little outside the norm, coming from parts of the world other than America and Britain. They also demonstrated that no matter the country, teenagers are united by a common language and it resonates. Possibly, for some, the solution is to go as far as possible from everyone and everything. The Moon, then, is perfect. The parents, too, have their own perspective. Eager for their children to extract all they can from this incredible life-changing adventure, they also have to face the fear and worry. Mia’s parents in particular realise the importance of this trip for the process of letting their daughter go, letting her lead her own life. The symbolism is strong. But, of course, as soon as the reality hits and the excitement of the lottery win wears off, the two girls and boy are faced with the very real danger of a trip into space, to spend 172 hours, a full week, on the surface of the Moon. It doesn’t help that they each experience mysterious and creepy clues that not all is as it seems. And they are not alone in this. The good reason for this unease is proven early on with NASA’s announcement that the team of teenagers and astronauts will stay in DARLAH 2 – a base on the Moon built secretly during the 70s as an extra measure of security during the Cold War. But, as one of the teens points out, what happened to DARLAH 1? The second half of the novel did its very best to give me the heebie jeebies. Once on the Moon, everything familiar is challenged and not even the most qualified astronaut is prepared for what they face. 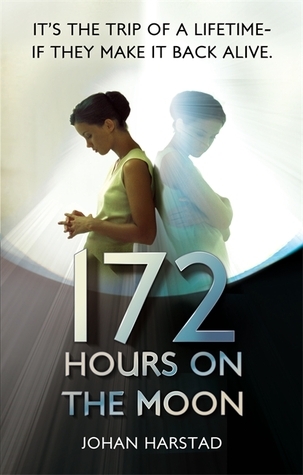 Suddenly, 172 hours seems a very long time indeed. 172 Hours on the Moon is a fun, fast, undemanding and spooky read, with characters (teen and astronaut) that do enough to make you very worried indeed for their chances. There might be the occasional loose end or plot hole but I was prepared to let those slip as the pages flew by. The book itself is an interesting one with plans, diagrams, images and an imaginative use of black and white. I originally intended to read this on the kindle but once I saw the book I had to read that instead. The Moon has fascinated me for as long as I can remember. After reading this, I might turn down the trip. This entry was posted in Horror, Review, Sci Fi, Young Adult and tagged Horror, Science Fiction, YA on July 8, 2012 by Kate (For Winter Nights). The books here are primarily of the Historical Fiction or Science Fiction bent with some Thrillers and Crime thrown in - but there are happy exceptions.